Knowing if and when you are dealing with an anxious pet so that you can prepare for their needs will make the grooming session easier on yourself while also creating a better experience for your clients. If the pet is anxious, it is beneficial to be in a quiet room. Sometimes a muzzle or an air cloth can be helpful, in addition to adding treats. Learn more about handling anxious animals. It takes more than nail clippers to take care of your furry clients nails. Guillotines, scissors, and pliers can all be used for nail care. A guillotine works best for pets with smaller to medium sized nails. Scissor clippers are an easy and inexpensive alternative for pets with rounded nails because of the curved blade. Pliers are a popular tool amongst pet care professionals because they are extremely durable and last many years before the blades dull. A Nail file can also be used to smooth rough edges and shape the nail. Make sure that you are providing your staff with all the tools that they need to give the best care possible. Pet nails wear from running and walking, which is good because it is best to keep pet’s nails short. If left unchecked though, the dewclaw can grow into the nail bed and can cause discomfort for the pet, similar to an ingrown toenail. Also, you can check to see the difference in nail length from the front paws to the backs paws. With pets that propel themselves with their back legs, such as greyhounds, they wear the back nails down more. Make sure that your staff is checking for these common conditions to avoid pain and provide happy pets. Look at the nail color, thickness, and texture of all of your canine clients. If the pet has brittle nails, this can be a sign of infection, disease, or a nutritional deficiency. Your staff should also check to see if there is dryness or cracking in the pet’s paw or pad condition. If you notice dryness or cracking, this pup may need an ointment. Selling additional care products like ointments can be an additional revenue source for your business. 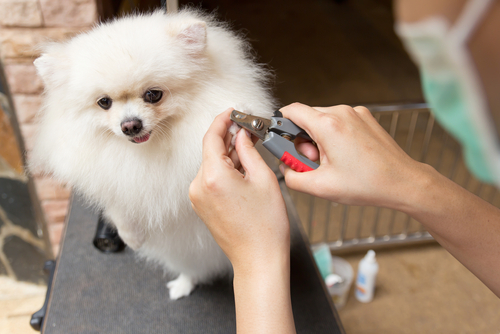 Pet groomers can use nail caps and nail polish to protect nails while adding pizazz to the grooming session. Nail caps are a practical solution for pets who scratch too much. Nail caps are applied to the nail with a non-toxic adhesive that mutes scratching damage to skin, floors, and furniture. Nail caps also come in different color combinations and can be used as an accessory for owners looking for trendier options for their pet. For groomers who are looking to increase client satisfaction and bring in extra cash, nail care add-ons is a great way to do that! To learn tips about the pet service industry, follow SinglePlatform on Facebook, Twitter, and Instagram.